Our mini groundnut oil mill plant can be used to deal with 1-5 tons groundnut every day. There are mainly three machines in mini groundnut oil mill. 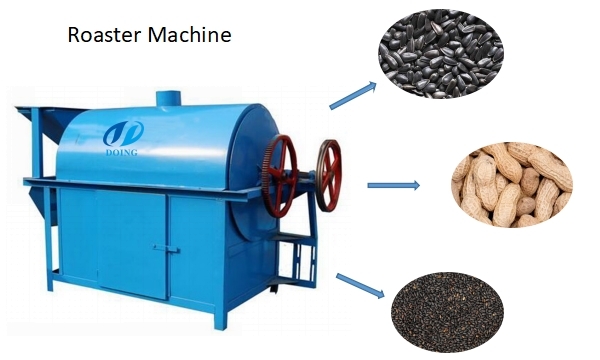 They are groundnut sheller machine, groundnut roaster and groundnut oil presser(with vacuum filter). And these machines are all easy operating and low price. Next, I will introduce the machines one by one. As the picture shows that groundnut sheller machine consists of frame, fan, rotor, screen hopper, triangle belt wheel and its driving V-belt. This groundnut sheller machine is suitable for small scale groundnut oil mill plant, and also for home use, which can remove the groundnut shell easily. 1. It is a professional equipment for peanut shelling, used to separate peanut kernels and shells. 2. Our peanut sheller machine has the advantages of simple structure, convenient operation, low power consumption, low noise and less power consumption. 3. The peanut sheller machine has a certain versatility, which can remove a variety of crops, improving the utilization of machinery and equipment. 4. The shelling rate of groundnut can reach 99%, and the groundnuts after shelling are very clean. Besides, the productivity is high, and the crushing rate is small. 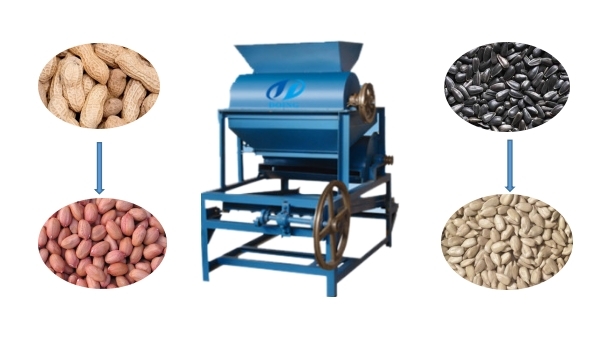 The groundnut roaster machine is used for roasting the groundnut/peanut in small scale groundnut oil mill plant, which can also be used to roast sunflower seed, walnut, sesame and other oil seeds. It is widely used in food area. In small scale groundnut oil mill plant, many people choose common cooking oil screw press machine. But we recommend this groundnut oil presser with vacuum filter, which is mainly composed of electric control, automatic heating, adjustment, transmission and vacuum oil filter components. 1. 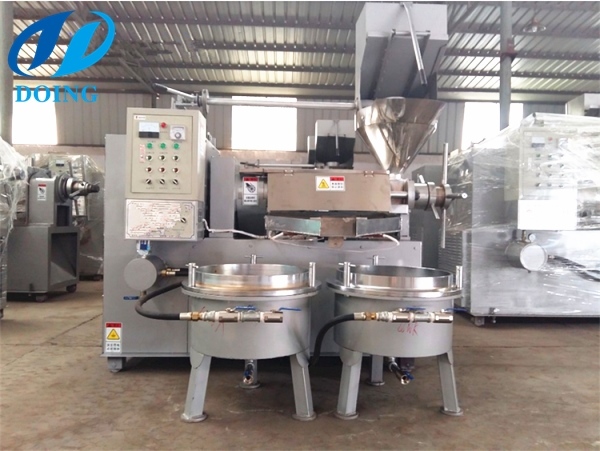 The groundnut oil presser machine is fully adopted mechanical driven, which connects with a series small oil processing equipment together to realize continuous oil extraction with easier operation and higher rate of oil yield. 2. This kind of groundnut oil presser machine is able to process a great many of vegetable oil seeds, such as soybeans, peanuts, cotton seeds, sunflower seeds, sesame seeds, palm kernel, coconut etc. 3. All working processes are controlled by the controlling panel. Before pressing, some parts of the oil press machine such as the press chamber, press screw and press ring will be pre-heated. During pressing, the press can filter the oil in due time. If one drum is full it would change to use the other and automatically put the oil out of the drum. 4. Oil yield is higher than common oil press. The three main machines in small scale groundnut oil mill plant have been introduced in details. Generally speaking, setting up a small scale groundnut oil mill plant should be your first choice to start the groundnut oil making business, because it don't have to large investment, occupying fewer land space, saving labor and widely application. 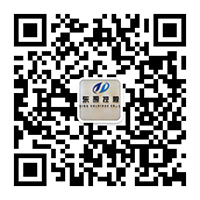 Henan Doing Company has professional engineers to help you. We are waiting for your enquiry all the time. If you wanna to get more details about 1-5tpd mini groundnut oil mill plant you can send E-mail to market@doinggroup.com. You can consult our professional engineer and specialized sales team with leave a message in below form.We will contact with you ASAP.You also can visit our factory in Henan,China.Get Detailed address.